The Cyrus E. Dallin Art Museum, located in Arlington, Massachusetts, is dedicated to collecting, exhibiting, and educating the public about the life and artistic works of Cyrus Dallin (1861-1944). Dallin's work, primarily sculptural, includes portraits, allegorical and historical subjects, public monuments, and Native American subjects. 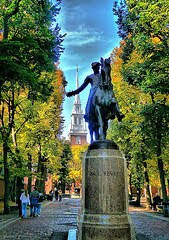 Among Dallin’s most famous works is his sculpture of Paul Revere in Boston’s North End. His struggle to give Boston this monument was a 58-year saga, begun in 1883 with a winning entry in a design competition and ending as his final accomplishment in 1940. In the intervening years, Dallin created seven versions of the Paul Revere sculpture. To view the multiple designs and to learn about his ordeal, which included corrupt Boston officials, broken promises, and, in the end, his own money, please visit the Dallin Museum. The museum is located in the historic Jefferson Cutter House. The museum is open Thursdays through Sundays from 12:00 P.M. to 4:00 P.M.